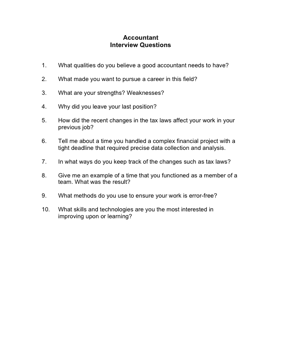 Choose your next Accountant with the aid of these helpful interview questions. 1. What qualities do you believe a good accountant needs to have? 2. What made you want to pursue a career in this field? 3. What are your strengths? Weaknesses? 5. How did the recent changes in the tax laws affect your work in your previous job? 6. Tell me about a time you handled a complex financial project with a tight deadline that required precise data collection and analysis. 7. In what ways do you keep track of the changes such as tax laws? 8. Give me an example of a time that you functioned as a member of a team. What was the result? 9. What methods do you use to ensure your work is error-free?